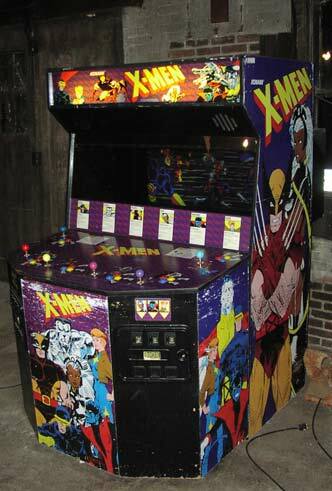 I remember this arcade game being a huge quarter sink in my young days of being in the arcades. 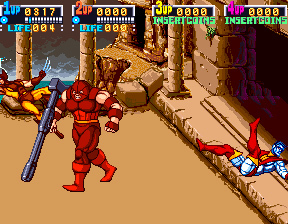 In fact playing this game brings back fond memories of my best friend’s birthday party, sitting on the 4-player machine with him and 2 other friends the whole time playing it. Mind you our parents and the rest of the guests were none to happy with us, but after about 6 dollars, we had the game beaten and we were the greatest 11 year olds at that party! Now that I am done dating myself and proving that I have been a video game geek since even before my teenage years, why don’t we talk about how the game feels 18 years later. Video gaming has come a long way since then, and some games hold up to the age well, while other games don’t. 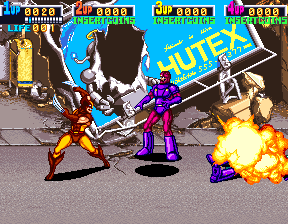 The first thing to point out to those that might be on the up and up with games, is that X-men Arcade is not based off the much loved X-Men cartoon that we all might remember from 1992. If you are unfamiliar with what I am talking about, click here and start at episode 1, it’s WELL worth it, and the animation has held with age. No worries, we can wait, we know you will be back. 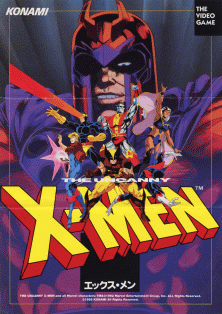 Okay, back to the point at hand, the video game is actually based off the failed 1989 pilot for an X-men cartoon called Pryde of the X-men. Art style, characters, even the original voice acting, all came from that Cartoon. In the XBLA adaptation of the game, most of the voices have been redubbed so that the age of the game doesn’t show as much. In fact, some of the voice actors from the 1992 cartoon lend their talents for the new voices in the game. It gives it that nice feel if you remember watching the cartoon as a kid (which I do). 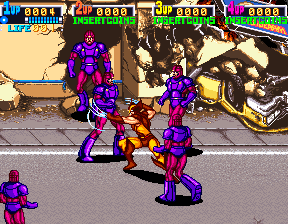 The XBLA version of the game is a direct port over from the arcade game. None of the game play mechanics have changed. 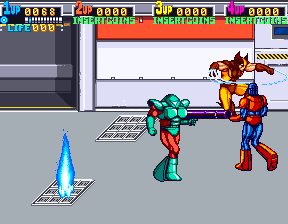 It is your arcade style beat’em up, with three main buttons (punch, jump, and mutant power) and the ability to move left and right, as well as up and down, to give you that 3 dimensional feel. 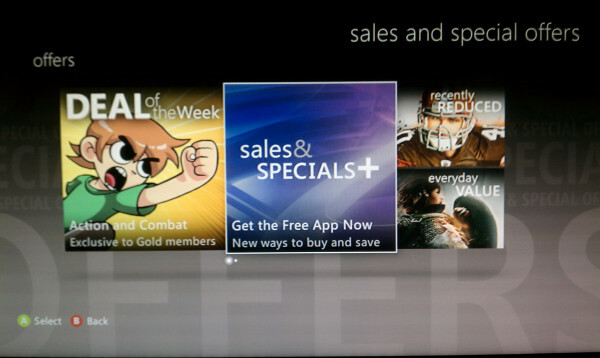 I am not going to pull any punches, this is a very retro feeling XBLA game. 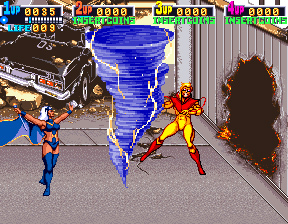 The game also offers being able to play the Japanese version, which is slightly different than the American version of the game. In the Japanese version, there are power pills and health pick-ups. The game also allows you to choose what difficulty setting to play, you can make the game really easy, or you can ramp it up to some extremely hard difficulties. I have to admit that I love that you can play the game online, and it allows for drop in and drop out players, just like the arcade did. People can just pick up and play and go forth into the game with you at any point in time. Heck, grab 5 of your closest Xbox Live friends, and take down the master of magnetism, but be warned, the game has some seriously flaws. To me, the game didn’t age as gracefully as I hoped. Don’t get me wrong, I loved playing it again, but I ended up playing it solo. Playing a game like this solo really does ruin the experience, so you need to make sure you have a couple of friends that are going to go into it with you. Another major draw back I found was the unlimited continues. For me, this truly ruins the game, and makes it easy even on the hardest difficulty levels. When you continue you don’t lose any of the score you racked up either, so in essence there is no penalty for having to continue. You no longer have the stress of having to decide when the best time to use the mutant power is. This is also the problem with playing pick up games online. Most of the time you end up in a game where someone is spamming the mutant power button. Sadly, for me, this game is going to end up being one of the games I get all the achievements in and pull out if I want to remember those hours spent in the arcade trying to beat this game on the limited funds I had then.